If you need to update your email account settings or set up your email account in Outlook manually, use the following steps. Sometimes you need to make a change to your email account settings. If you have a new password, if your email provider has asked you to change settings, or if you're having problems with sending and receiving email, you can change your email account settings in a few steps. Use the dropdown under Account Information to select the account you want to change. Select the type of information you want to change. Account Settings allows you to add or remove accounts, change server settings, and more. Account Name and Sync Settings lets you update the friendly name for the account and decide how many days' worth of email you'd like to synchronize. Server Settings lets you change the login information, including the password, server name, port, and authentication settings. Change Profile lets you switch to a new profile. Manage Profiles lets you add or remove profiles or change profile settings. The most common settings you'll change are Server Settings. Select either Incoming mail or Outgoing mail to change a variety of server settings. This is also where you can update your email password (after you've changed the password with your email provider). When you're done updating your settings, select Next > Done. 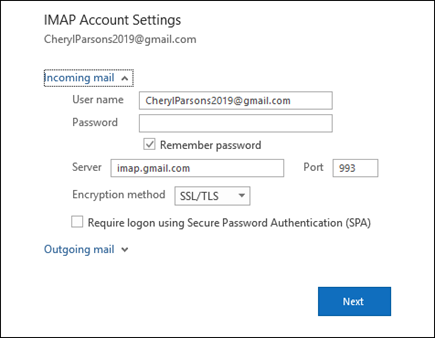 If you need to enter specific values for incoming and outgoing server names, port numbers, or SSL settings, you can use Outlook's advanced setup option. 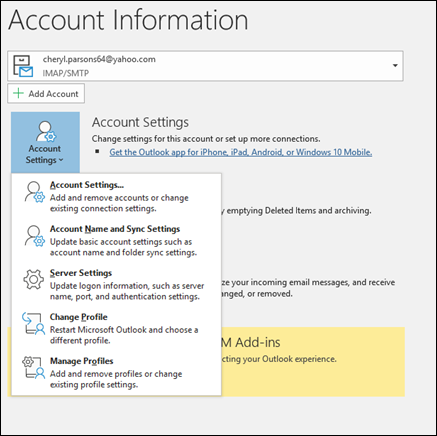 You can use these instructions to add a POP or IMAP account to Outlook. On the next screen, enter your email address, select Advanced options, then check the box for Let me set up my account manually and select Connect. Select your account type. Most of the time when you need to use this option, you'll select IMAP. The Account settings screen should be pre-populated with most of the account settings you need. However, if you need to look up your settings, see the POP and IMAP account settings topic. Enter your incoming and outgoing server settings and then select Next. Enter your password and then select Connect. If you are using a third-party MAPI provider, download and configure the MAPI email provider application as suggested by provider company. On the next screen, enter your email address, select Advanced options, check the box for Let me set up my account manually, and select Connect. On the Advanced Setup screen, select Other. On the Other screen, choose the type of server to connect to from the list. Note: The Other option and your account type listed under it will only appear if you’ve properly installed and configured the MAPI provider. The third-party MAPI provider application installed on your machine should launch. Finalize the account setup by following the MAPI provider's instructions.